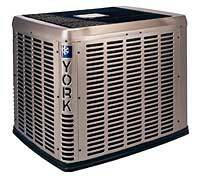 The Affinity YZH Series 18 SEER split-system heat pump from York, a division of Johnson Controls, uses a microprocessor-controlled demand-defrost system. As a result, defrosting cycles occur only when necessary, and an adjustable balance point ensures supplemental heat is supplied only when required to meet the space load. In the event improper operating conditions occur, the unit will automatically shut down to protect the unit’s refrigerant system and switch to back-up heat. On-board diagnostic LEDs then guide technicians to the source of the problem. The control also features non-volatile memory, which preserves fault codes in the event of power loss. An anti-short cycle timer extends the life of the compressor by preventing short-cycling.